IBA Endstation - National Electrostatics Corp. The NEC ion beam analysis (IBA) endstation, model RC43, is a versatile accessory for Pelletrons or other ion beam accelerators. When combined with a Pelletron accelerator and associated ion source and beamline components, the endstation provides a complete IBA system offering automatic unattended data collection and can perform qualitative analysis using multiple techniques such as RBS, ERD, NRA and PIXE simultaneously. NEC also offers a microprobe for beam sizes of 20 microns and external beam capabilities. Please see our Techniques section for further information on these techniques and their applications. The scattering chamber is constructed primarily from aluminum with a 17″ (43cm) inside diameter and an 8″ (20cm) inside height. 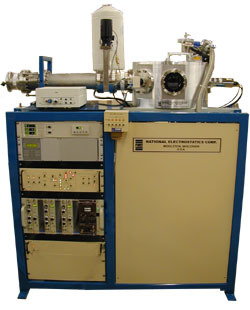 The base of the chamber provides stable support for the target manipulator, solid state particle detector, beam collimator, and turbo-molecular pump. The chamber has a view port, target alignment laser, and video camera. A target load lock is placed in the lid to permit quick (less than 5 minute) changes of target holders while maintaining high vacuum. The chamber can accommodate up to 16 samples, 1cm x 1cm, side by side. It is electrically isolated and can be used as a Faraday cup for precise beam current measurements. The RC43 incorporates a manipulator with a motorized rotary drive. This manipulator allows precise control of target movement in the X, Y, and Z directions with polar and azimuthal rotation. The stepper motor controller interfaces with the control computer and will control all five motors at one time. Local control of the manipulator is also available when adding samples. A digital current integrator is provided to measure total ion beam currents and provide gate signals for the RBS or NRA measurements by monitoring total ion current on the target. A turbo-molecular pump and forepump are furnished to pump the target chamber and beamline near the chamber and the target load lock. Solenoid and pneumatic valves with appropriate controllers and gauges are provided to automatically pump out or vent the chamber. Sample positioning and data acquisition with the RC43 endstation is accomplished with a remote control system. This control system includes software for both qualitative and quantitative analysis. Qualitative analysis is performed by the RC43 Analytical Data Collection software. Quantitative analysis is performed by the RUMP program developed by L.R. Doolittle of Cornell University, as well as other analysis programs. The RC43 control system also communicates with the accelerator control system itself, receiving beam energy information and sending instructions to produce the optimal beam conditions during real time runs. NEC offers, as an option, a high resolution RBS detector system. This detector adds the capability of Ångstrom range depth profiling.